Functional with a custom look for the Electra Glide, Street Glide & Road Glide! 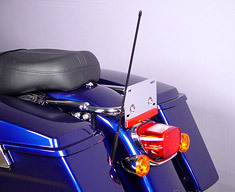 AM-01: Relocate your AM/FM antenna from your tour-pak or saddlebag location to the front of your motorcycle for a more ergonomic solution. 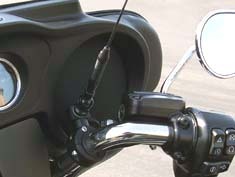 Over the years H-D has shortened their antennas because of the survivability at the rear location on the bike. The tour-pak and saddlebag mount locations are problematic as the antennas are in the way when you walk around the bike, manipulate the fuel nozzle at the gas station or simply dealing with your tour-pak or saddlebag storage. Antennas are often broken in these locations. See our Blog page. 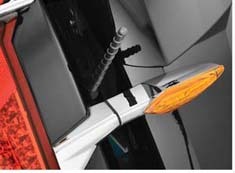 The AM-01 Mounting Kit relocates your antenna to the front of the bike while maintaining all the benefits of an external mast antenna. 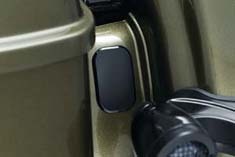 The antenna profile is within the bike's profile and out of the way. Provides better parking foot-print. 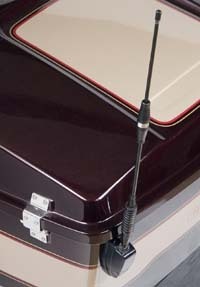 Accommodates your current stock AM/FM antenna or longer whip antennas. The kit's antenna connector is plug-n-play with older and current Project Rushmore bikes. Fits stock 1" or 1-1/4"handlebar. Includes adjustable-angle custom handlebar mount, antenna cable, connector adapter, antenna hole plug assemble and hardware. Finish: satin black. Antenna sold separately. 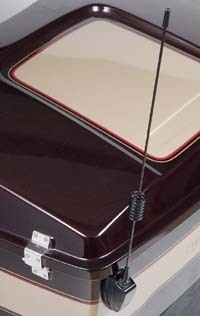 Shorty Antennas are shorter, rigid, semi-rigid and flexible antenna replacements for the Electra Glide and Road Glide. Made of high quality stainless steel with a polished or black finish. Engineered for exceptional reception. Available in 6, 9, 12, 13, 15 and 19 inch lengths with an amplified booster model (STY-B13) extendable from 9.5 to 16 inches. 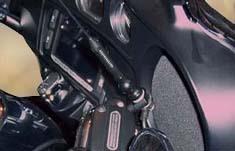 The 19 inch Ultra, Classic and Road Shortys are for use on the Ultra, Classic, Street Glide and Road Glide and are designed for AM/FM/WB and CB. Shorty antennas eliminate the annoying aspects of the taller stock antennas. These shorter styles work particularly well with motorcycle covers. All antennas are special sale items. 862, 863, 864: Introducing a billet antenna that’s made for people who do a whole lot of riding. No more bent or broken antenna studs thanks to the rubber over-molded spring base allowing the antenna to flex if bumped or hit. 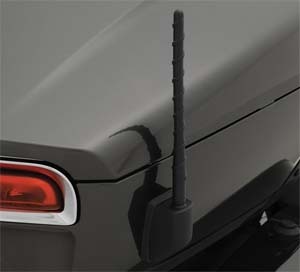 These 12” antennas pick up AM/FM signals (no CB) & are a direct replacement for OEM. Available in chrome or two tone finishes; install in just seconds. 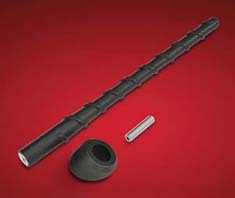 Fits: ’89-’12 Electra Glides, Road Glides, Street Glides, Tour Glides & Trikes – AM/FM applications only. 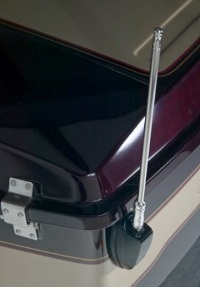 SU9-B19H Ultra Shortys: These Quad-Band Shorty antennas are 19 inches and are designed specifically for the Harley CB cable/load system with coil in the tour-pak (pre-tuned for the CB, NO-SWR adjustment necessary) and also the Harley AM/FM/WB portion of the audio system (same antenna, interchangeable) for the tour-pak mounting position only for MY '09 to current Ultra Classics. Installation is a snap as you just loosen the set screw on the factory antenna, unscrew it form the mounting stud, screw on and re-tighten the set screw. 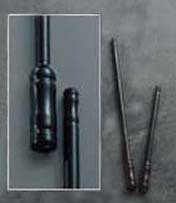 This antenna features a top-loaded copper-wound fiberglass rod, with heavy-duty spring built into the base. 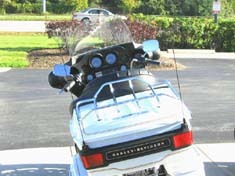 It can be folded down to allow easy installation of your motorcycle weather cover. SU8-B19H: Similar to above but for modle years: '98 to '08. 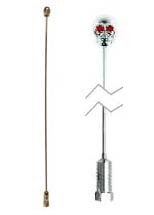 SAM-B19H: This compact AM/FM/WB antenna is only 19" tall, and is a stylish change from the Original Equipment whip antenna. 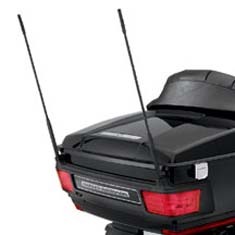 The low-profile antenna simplifies covering the bike for storage. Easy-to-install, the Shorty Antenna screws on to the factory antenna mount. Fits '98-later Touring models equipped with radio. 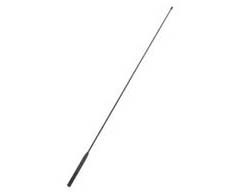 SCB-B09H: This compact CB Antenna is only 19" tall, and is a stylish change from the Original Equipment whip antenna. The low-profile simplifies covering the bike for storage. Easy to install, the Shorty Antenna screws on to the factory antenna mount. Fits '09-later Touring models equipped with Bike-to-Bike Communication. May require model-specific mounting bracket if installed on a model without a Tour-Pak® carrier. 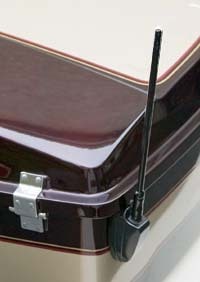 SCB-B08H: This compact CB Antenna is only 19" tall, and is a stylish change from the Original Equipment whip antenna. The low-profile simplifies covering the bike for storage. Easy to install, the Shorty Antenna screws on to the factory antenna mount. Fits '98-'08 Touring models equipped with Bike-to-Bike Communication. May require model-specific mounting bracket if installed on a model without a Tour-Pak® carrier. SAS-B32H: Original equipment style fiberglass 32.5" AM/FM antenna. STY-B13 High Performance: The STY-B13 High Performance amplified booster model is extendable from 9.5 to 16 inches and is finished in black powder-coat. Excellent for the Electra Glide Classic, Street Glide or Road Glide models. Spacer included if needed. 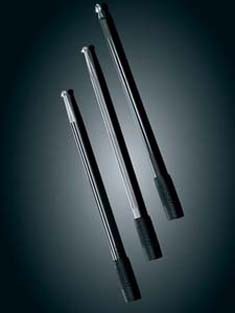 BSK-B6 or BSK-B9: "Big Stick", a full 7/16" diameter, stainless steel with black powder coat finish. A very custom beefy look. Fits Electra Glide, Street Glide or Road Glide. Recommended for custom use. BSK-P6 or BSK-P9: "Big Stick", a full 7/16" diameter, stainless steel with polished finish. A very custom beefy look. Fits Electra Glide, Street Glide or Road Glide. Recommended for custom use. SBY-B6 or SBY-B9: Made of high quality stainless steel with a black powder-coat finish w/~4/16" diameter. A very custom look. 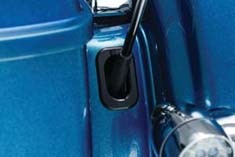 Fits Electra Glide, Street Glide or Road Glide. Recommended for custom use. SBY-P6 or SBY-P9: Made of high quality stainless steel with a polished finish w/~4/16" diameter. A very custom look. Fits Electra Glide, Street Glide or Road Glide. Recommended for custom use. 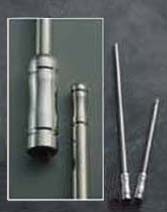 SKP-T or SKP-S: Chrome antennas with small skull on top. SKP-T is 19" with skull & w/red eyes. SKP-S is 14.5" with small skull only. SCY-B15: Cellular style (Hog-Tail) AM/FM Shorty in black. 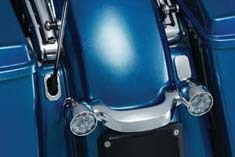 Fits Electra Glide, Street Glide or Road Glide. Spacer included if needed. SCY-B15P: Premium Cellular style (Hog-Tail) AM/FM Shorty in black. Similar to above but a little thicker & higher quality in construction. 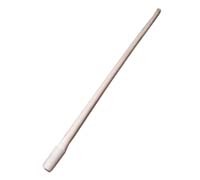 SBB-7: This Short Spiral Antenna is a great replacement for those long stock OEM whips that do not work with covers, get in the way of low overhead garage doors and are just a nuisance. 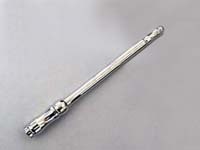 This 7 ½’’ tall antenna is easily installed asa direct replacement for Can-Am RT, Victory, Star Venture and Harley AM/FM antennas. Includes a new grommet for the Can-Am RT that will stay put and complete the installation. Includes removable M6-1.0 threaded screw to mount on any model needed. 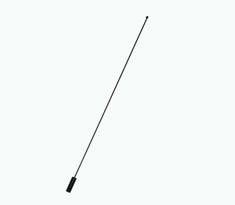 SRD-B14: Rubber Duck style Flexible Shorty Antenna in black, 13.5 to 14.5 inches. 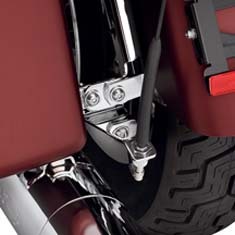 SHY-MT: An antenna mount for older FLH bikes w/Tour-pak or custom fairing applications. Black ball and socket design and AM/FM cable and connector. Swivels from 0 to 90 degrees for top or side mount. 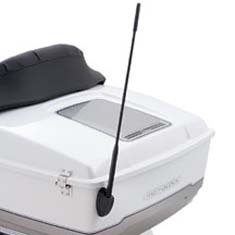 Shorty Antennas and CB Reception: Many of our Ultra owners do run the Shorty Antennas other than the 18 inch models on their bikes (to balance the appearance) but they are typcially riders who do not use their CB frequently for transmission. Frequent CB users should opt for the 18 inch Shorty Antennas. AHA-6,7,8,9: For those who care about the little details, our Antenna Hole Accents replace the stock rubber unit with easy snap-in installation. Injection-molded ABS available in your choice of chrome or gloss black finish. Fitment Details: AHA-6 Harley '06-'18 Street Glide & '10-'18 Road Glide (Except CVO Models), AHA-7 Harley '06-'18 Street Glide '10-'18 Road Glide, '17-'18 Road King Special (Except CVO Models) AHA-8 Harley '06-'18 Street Glide & '10-'18 Road Glide (Except CVO Models), AHA-9Harley '06-'18 Street Glide, '10-'18 Road Glide & Road King Special (Except CVO Models). 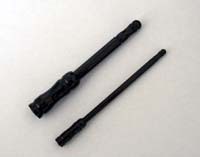 BSK-B6 "Big Stick" compared to SBY-B6 "Shorty"